Every year, the President of the United States issues a proclamation in honor of Child Health Day (the first Monday of October), which in turn launches Children’s Health Month. President Calvin Coolidge was the first president to dedicate a special day to children’s health, in 1928, recognizing that “the conservation and promotion of child health places upon us a grave responsibility.” The U.S. is not living up to that vital responsibility and, in fact, is failing children miserably. American children’s ability to develop and thrive is being sabotaged by an avalanche of chronic ailments, with pediatric rates of some chronic conditions among the highest in the world. 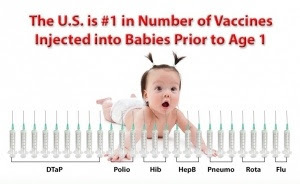 Infants in the U.S. receive more vaccines in their first year of life than anywhere else in the world, yet the U.S. infant mortality rate is much higher than in other high-income countries. At this juncture, millions of children’s futures are at stake. It is critically important to honestly assess whether vaccines have had a net negative impact rather than the “enormous” beneficial impact that the public health establishment likes to present as fact.